Which US Equities Does China Currently Own? 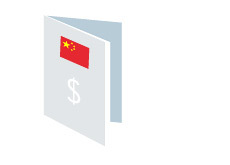 According to the New York Times (link below), China's sovereign wealth fund, China Investment Corporation, purchased more than $9 billion dollars worth of US equities last year. Now, this is just a small drop in the bucket compared to the overall value of the sovereign wealth fund ($300 billion dollars), but it is interesting to see exactly which US equities that China thinks constitute a sound investment. China has been actively working to diversify its $2 trillion+ plus worth of forex holdings over the past few years. The country has been moving away from investing almost exclusively in US debt offerings, choosing instead to put more and more money into alternative investments such as commodities and equities. This is a diverse portfolio that includes the likes of Apple, Visa and Pfizer. The Chinese sovereign wealth fund has particularly large stakes in Teck Resources Ltd., Visa, Morgan Stanley, Citigroup and Blackrock. Not exactly earth-shattering stuff here, but interesting nonetheless.